Plenty of ergonomic features grace this Breville juicer. 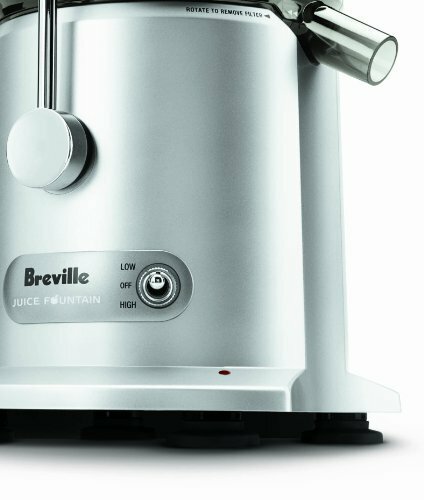 Be it soft fruits or hard vegetables, nothing will stand in the way of the Breville JE98XL and its powerful 850 Watt motor. This centrifugal juicer operates at two speeds, 6500 RPM and 12,000RPM ideal for soft fruits and harder vegetables respectively. There is no need to slice and dice vegetables or fruits when adding it to this juicer because of its 3 inch wide feed chute. 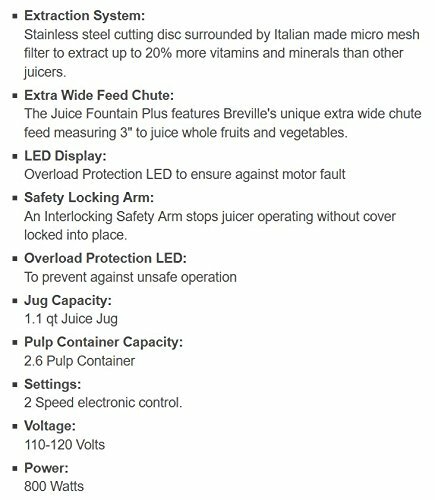 It features a Nutri Disc with stainless steel mesh filters and steel blades, patented central feed system that maximums extraction of juice while removing pulp with the utmost efficiency. The polymer body is designed to withstand vibration and last longer. 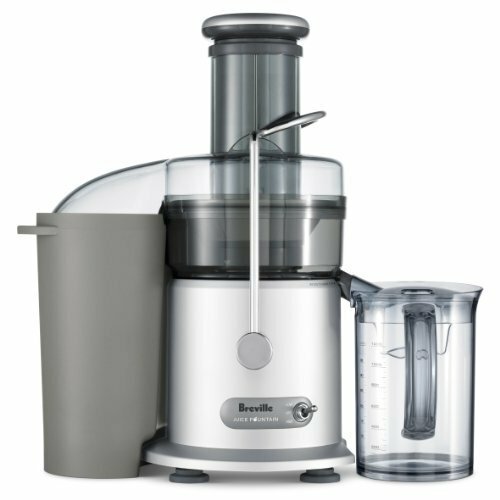 Plenty of ergonomic features grace this Breville juicer such as a froth separator fitted liter jug, wrap around cord storage and integrated handles on the pulp collector. 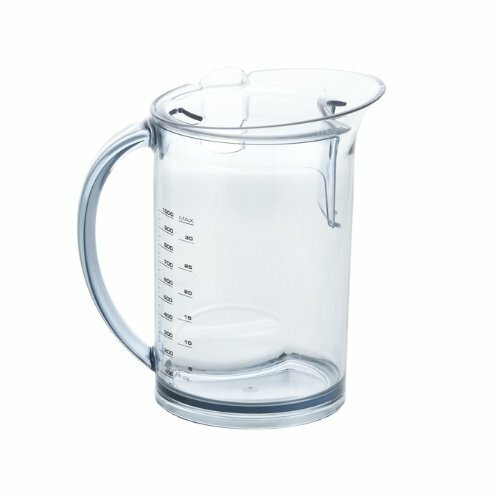 All plastic components used in the manufacture of the Breville JE98XL are BPA free and are easy to clean up afterwards. Other than the filter basket, Nutri Disc and food pusher, everything else is dishwasher safe. For us, time is of the essence and so a masticating juicer is simply out of question. We cannot wait around a machine for 30 minutes just to extract maximum juice and nutrition from vegetables and fruits. Nevertheless, we wanted something that would not waste too much food but still manage to juice through the ingredients real quick. The Breville JE98XL gave me this and much more. To start with, it does not heat up the ingredients and so nothing gets destroyed during juicing, which masticating juicers tend to do. It only took us 5 minutes to make fresh organic juice from a combination of raw foods, without the need to slice them into tiny pieces. We just need to peel oranges, wash vegetables and drop them into the chute randomly to get a green energy drink early in the morning. It’s mighty easy to clean up and hardly ever needs a push or a prod to get going. Okay, so you aren’t going to get maximum efficiency with the JE98XL but that is fine as long as it reduces the time required by half. This juicer even manages to handle vegetables such as beet and carrot without spilling anything on the counter or breaking down. So, yes it juices any kind of raw food thrown at it without the need to dice them up and still manages to continue forth. Although it’s been just three weeks since we were able to test this juicer, from what I hear, it is not just durable and sturdy in construction but also a lifetime companion. As easy as it gets – Yes, the Breville JE98XL is actually simple to use. A centrifugal juicer to the core, it takes in veggies and fruits from the open top vertical chute, helping create a quick serving of juice. You may have to cut up a few fruits though before feeding it down this juicer. Quick and easy snap-off parts make cleaning quite easy. Every component other than the base is dishwasher safe or in other words, quick to clean. Don’t expect a high juice quality yet. The Breville JE98XL is supposed to be an affordable run-of-the-mill juicer. Nevertheless, it doesn’t disappoint on quality, just not as great as you would expect with a masticating juicer. Astonishingly, this juicer actually manages to squeeze a lot of juice out leaving a semi-dry pulp. Granted, few more rounds will extract some more juice, but when you are in a hurry, you really won’t find the difference that important. Being a starting model, the Breville JE98XL is quite powerful but it does tend to vibrate a lot because of this power and hence we have deducted a point for the same. Yup, the JE98XL is noisy but not so much that you need to wear protective ear blocks. Thankfully, the sound doesn’t go farther than the kitchen. We found that this juicer produces a semi dry pulp, which means that there is still some juice left in the pulp but it’s not much. In fact, running the pulp through any masticating juicer would probably yield only 1/3rd of a glass. I would any day sacrifice efficiency for ease of use and so for me, this juicer makes better sense than trying to squeeze the last drop of juice from pulp. Pros: Inexpensive, easy to use and quite handy when you are in a hurry. It is also pretty easy to clean. Cons: Not the most powerful neither is it silent but it gets the job done albeit with a slightly soggy pulp residue. 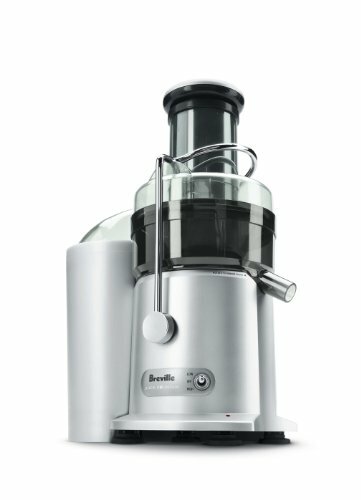 If you want a juicer that can churn through tough fruits and vegetables without the need to peel them or slice them then get the Breville JE98XL. It might operate as a centrifugal juicer but its efficiency is just one notch below a masticating juicer while being much quicker than the latter. Do not be fooled by its plastic construction, everything is high quality with this juicer including its 850 Watt commercial motor and dual speed operation. Weighs under 15 pounds and measures 13.2 Inch by 16.5 Inch by 18.2 Inch. 3 Inch feeder mouth removes the need to chop fruits and vegetables. Dual speed operations at 850 Watt peak power output. Overload protection, safety locking arms and a large pulp collector capacity with side handles. All plastic components are BPA free, dishwasher safe. Comes with cleaning brush, filter basket, liter jug froth collector.